Hexalot Game Review - Download and Play Free Version! Guide your Knights across bridges to save Hexalot! Hexalot, the mind-bending puzzle game! As Merlin, King Arthur's #1 magical mind, it is up to you to build bridges across treacherous puzzlescapes and bring the Knights of the Round Table back to Hexalot! Place different combinations of hexes on the board to form bridges. Move more than 1 knight to a castle at a time for big bonuses. It starts out easy but as you advance, you will have to be more strategic to score big and solve the levels. Every level changes and there are thousands of solutions. 2 game modes and 3 difficulty levels will keep you challenged. Save your game at any time. Enjoy enchanting music and beautiful medieval inspired graphics for hours of puzzle fun. Hurry up, before King Arthur's realm is lost forever! Download and play Hexalot today! 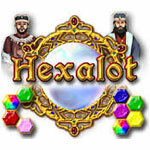 Hexalot is a fairly challenging medieval-themed puzzle game. Your goal is to move knights from one side of the level to the other by building bridges made of colored hexagon pieces. The hexagon shapes add a level of complexity to the movement of knights with six possible directions to consider and choose from. A limited number of pieces and a variety of obstacles mean that strategy and planning are important keys to success. Levels in Hexalot are made up entirely of differing layouts of hexagons. Some will contain knights and the castles which they much reach, while others may contain obstacles or nothing at all. 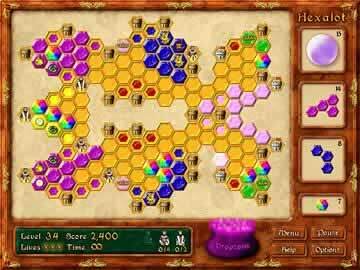 You must choose colored hexagon pieces and build a bridge from the knights to the castles. This starts off quite simple with only a single color and a straight path between the two, but becomes increasingly difficult as more colors and complicated paths are introduced. There will be hexagon spots that require a certain color, or that already have a color in place that you need to use. The different designs and obstacles make each level a truly unique challenge. There are two different game modes to choose from in Hexalot. Arcade Mode lets you race against the clock to complete levels and earn the best score you can. 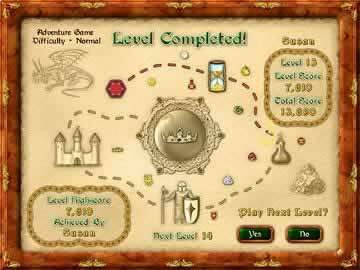 Adventure Mode provides unlimited time to complete levels. Aside from the timed aspect of Arcade Mode, there is little difference between the two. You can choose from one of three provided difficulty levels that will affect the number of pieces (and time in Arcade Mode) you have available for you to use. Unfortunately, levels can be difficult to complete even on the easiest difficulty setting. There is the option to redo levels, but no possibility to undo moves if you make a mistake. While it will provide a great strategic challenge for experienced puzzle players, it may be more frustrating or too difficult for others in later levels. Hexalot has simple controls and the basics of play are easy to learn thanks to helpful in-game tips. As you play the game and encounter new mechanics, these tips will appear explaining them to you. Earlier levels also act as tutorials to get you familiar with the gameplay. Pieces are selected and placed with the use of the mouse and rotated with the spacebar. As hinted at earlier, Hexalot has a medieval theme and story. The knights and castles mentioned are just a part of that theme. Medieval-themed music and other small touches contribute as well. For example, the background behind the levels looks like old parchment and a cauldron is used to dispose of unwanted hexagon pieces. Despite the theme and materials to work with, however, the story behind the game has little important or presence in the game. Fans of puzzle games will find a lot to enjoy in Hexalot. A large number of levels with unique challenges and obstacles await Strategy and planning play a big role as you work towards just one of many possible solutions. Choose the difficulty that is right for you. Compete to get the best high score possible and earn a place in the online Hall of Fame. Hexalot is a great game if you enjoy the puzzle genre, and still worth a try even if you don't.